Thinking of having a polished or decorative concrete floor? Call 770-971-2778. 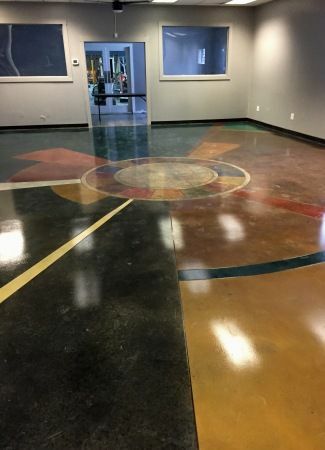 Our concrete floor consultants can help you with design ideas, material specifications, pricing and more. Before you jump straight into a concrete floor job you need to understand your options. What you choose to do affects many things from your overall satisfaction to maintenance and project cost. It makes good sense to meet with a concrete floor expert and explore the fine points of this endeavor. We offer FREE CONSULTING on all but the most complicated projects. For friendly, professional help simply call 770-971-2778 or contact us online. When do we charge for consulting? For certain major commercial or industrial projects we can serve as part of the architectural design team. For projects wherethere is travel costs, and extended administrative costs a fee may be necessary. As concrete floor consultants we can develop proprietary or performance specificatiions, assist with product supplier qualifications, and more. Total square footage of the project.